‘The Mystery Train Radio Show’. For a musical journey that covers both new and familiar ground join Alex Huskisson. ‘The Mystery Train Radio Show’ features singer songwriters, bands and music makers – local, national and international. As well as the best in new music, this program takes a look at events that have happened in the history of popular music (from the 1930’s – bang up to date). Live music and interviews may well be incorporated. 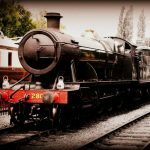 ‘The Mystery Train Radio Show’ loves to air music from artists based in Gloucestershire (where the radio station is based) and from further afield, in fact you’re likely to hear music from the 4 corners of the planet! Join Alex every Sunday from 10pm till midnight. Live from the Mystery Train Goods Shed. Alex Huskisson presents a show about singer-songwriters, bands and music makers local, national and international. Hi Alex, I arrived late for departure – is there a Listen back car on the Mystery Train yet? Nice original idea Alex, congratulations, keep on track.